People walk near the U.S.-Mexico border on the beach on March 31, 2019, in Tijuana, Mexico. For example, critics seem to think an open borders policy would require the U.S. to return immediately to the type of wide-open southwestern border that existed in the 19th century. Major policy changes aren’t usually put in place overnight; they are phased in over time and in conjunction with other policy changes. A reasonable first step toward open borders would be for the United States to allow relatively free entry to Mexicans. U.S. media outlets ignore the major threat that Mexicans face from their northern neighbors: firearms. There’s a model for this: the current southwest border, although only in one direction. Legal entry to this country is nearly impossible for many or most Mexicans, but U.S. citizens can usually visit Mexico by presenting their passports, paying a small fee and passing through customs. Getting a Mexican work visa or resident status is more complicated, but nothing compared to the bureaucratic hurdles that U.S. policy sets for Mexicans. So, the United States could simply reciprocate — that is, treat Mexican citizens the way Mexico treats U.S. citizens. This would then be used as a model for agreements with other countries. (The United States currently has a similar policy with some 38 countries, mostly in Europe.) But a wide-open border with Mexico would have to wait for other changes — if only because of Mexican concerns about smuggling from the United States. With a few exceptions, U.S. media outlets ignore the major threat that Mexicans face from their northern neighbors: firearms. Mexico has strict gun control laws; the United States doesn’t. The result is a thriving industry of running guns from the United States into Mexico, where they provide much of the weaponry used by the country’s violent drug cartels. The availability of weapons from the north has contributed to Mexico’s soaring homicide rate over the past decade-and-a-half. A 2013 study estimated that nearly 253,000 guns purchased in the United States were flowing over the border each year, representing some 2.2 percent of total annual sales by U.S. firearms manufacturers. It’s clear that Mexican border security is failing to stop this flow effectively, but it’s equally clear that the problem would be even worse with no border controls at all. Over time, however, progressive governments in Mexico and the United States could deal with the root causes; reasonable anti-smuggling measures in the United States would sharply reduce the availability of weapons in Mexico, and drug trafficking would decrease if both countries moved toward decriminalization and health-centered policies to deal with drugs rather than the current enforcement-based approach, which even conservatives recognize has been a monumental failure. In the meantime, a relatively open Mexico-U.S. border would allow the two countries to reallocate resources from blocking human beings to blocking actual threats like military-style rifles. Still, a less restrictive immigration policy would certainly lead more people to migrate into the United States. The Gallup polling company has estimated, based on results from a 2013-16 worldwide survey, that some 147 million people “desire to migrate” here. How could the U.S. absorb that many new immigrants? Most of the U.S. population sides with progressives on nonintervention, fair trade, and realistic programs addressing gun violence, drugs and climate change. Of course, people who desire to migrate don’t necessarily follow through. For comparison, the poll indicates that about 10 percent of people in “Northern America” (Gallup’s term for Canada and the United States) want to leave their countries. In practice, just 3 percent of the combined Canadian and U.S. population actually live abroad, according to estimates provided by the two governments. Most people prefer to stay at home with their families and communities if they can; throughout history, major migrations have been by people who were pushed to flee violence or extreme deprivation, or who felt no hope for a better future at home. Consider the pattern of unauthorized migration to the United States over the past 40 years. The number of undocumented immigrants from Central America rose in the 1980s as deadly armed conflicts broke out or intensified in the region. The flow of undocumented Mexicans intensified in the 1990s as the North American Free Trade Agreement (NAFTA) took effect, and 2.3 million agricultural workers lost their jobs. The migration wave slowed when Mexico’s economy began to stabilize in the early 2000s, and it actually went negative after the U.S. economic meltdown in 2008, with the result that the total U.S. undocumented population has declined over the past decade. Migration from parts of Central America started increasing once again after 2008 as criminal violence picked up in that region, although not enough to change the overall decline in undocumented immigration. There are ominous signs that many of the current migrants from Central America are fleeing the effects of global climate change. U.S. government policies have played a significant role in spurring the unauthorized migration of the last four decades. Progressive policies would have the opposite effect. The Reagan administration spent billions arming right-wing forces in the Central American conflicts of the 1980s — nearly $5 billion in aid to El Salvador alone. The next two administrations promoted NAFTA and other neoliberal policies that drove immigration from Mexico in the 1990s. 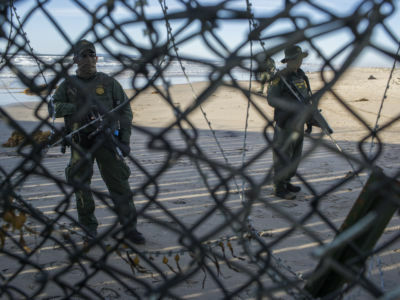 Gun smuggling from the U.S. and U.S.-backed drug enforcement programs fueled the violence motivating much of today’s migration from Central America. Meanwhile, as climate change becomes an ever more important factor, the current White House implements policies heightening the country’s role in the mounting catastrophe. When progressives raise these issues, both conservatives and establishment liberals complain about “blaming America first.” But the left is blaming the politicians and the corporate interests behind them, not “America.” The U.S. population didn’t create these policies, and it generally hasn’t supported them. For example, widespread U.S. grassroots opposition to Reagan’s Central American wars eventually forced his administration to fund one of the operations through the illegal Iran-Contra conspiracy. NAFTA was so unpopular that Donald Trump could still run against it in 2016, more than two decades after the agreement was signed. Recent polls show a growing majority of U.S. citizens supporting sensible firearm controls, a rational drug policy and a Green New Deal. In other words, most of the U.S. population sides with progressives on these issues. Implementation of a left agenda — nonintervention, fair trade, and realistic programs addressing gun violence, drugs and climate change — would be popular and would dramatically reduce the pressures for smuggling and for migration. As these policies became realities, people in other countries would be able to stay home, exercising what some Mexican activists call the right not to migrate, and the United States might finally be forced to end its expensive, murderous and ineffective efforts to shut out the world. Petersen-Smith is exactly right: Progressives have no reason to apologize for backing open borders. For one patient, a three-month supply of insulin is $3,700 in the U.S. versus $600 in Mexico.